How to Submit Blog Site URL to Bing and Yahoo to Get Indexed ? Bing is the second largest search engine on the market, which took 26.7% market share in 2011, said by Internet marketing leader comScore. Yahoo is the third largest search engine. Submit your new blog site's URL to Bing and Yahoo will maximum the chance to be exposed to most online users. Similar as submitting a blog/website url to Google as we see in previous post, there are two ways to submit your blog to Bing & Yahoo, from the submission pages and from the Bing Webmaster Tool. The submission pages will notify Bing & Yahoo robot to come to your site but does not guarantee every single pages can be found. Therefore submit a Sitemap will help the blog fully indexed. Yahoo's blog/website URL submission page is at http://search.yahoo.com/info/submit.html, it actually redirects users to Bing's submission. B. 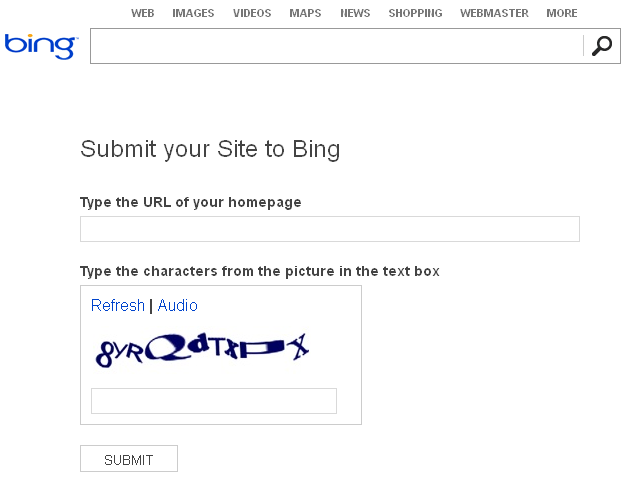 Register an account for Bing Webmaster Tool at http://www.bing.com/toolbox/webmaster , login to it. D. Type in your blog site URL, click Submit. That's it, you done !